I’ve got some news for you; prepping isn’t something new. In fact, prepping has existed ever since mankind crawled out of the trees and became hunter-gatherers, sometime back in prehistoric times. Humans couldn’t have survived the winter in colder climates, if they hadn’t learned how to become preppers. They would have starved to death. What makes prepping seem like something new is that since the start of the industrial revolution, we have moved farther and farther away from a survival mentality, and have instead adopted a luxury-based mentality. The average person in western culture doesn’t think about what they need to have in order to survive, because those things are all readily available, as long as one has money to buy them. But for most of human history, the economic base for society wasn’t industry, it was agriculture. Everyone needed to eat; and before the industrial revolution created the farm equipment of today, the vast majority of people were employed in agriculture, making sure that we could all eat. This meant taking advantage of the growing season, so that there would be enough food to make it through the annual “disaster,” called winter. If your farm was successful and you had a good harvest, you could eat. If not, you’d better find another source of food; maybe your neighbor had better luck than you did. Obviously, these farmers and the hunter-gatherers before them survived, or you and I wouldn’t be here today. So I’d say they must have known a thing or two about survival. The question for us, is what did they know, which we could learn from them? The early survival lessons were hard learned. The school of hard knocks is a really tough task-master, with an extremely steep grading curve. You either learned, or you died. Survival was nothing more than a passing grade. With lessons being so costly to learn, you can be sure that parents taught their children everything they knew. Fathers taught their sons and mothers taught their daughters in the only way they could, making their children work side-by-side with them, as they did the things they needed to do to survive. Failure to do so was costly, as the children would probably not survive. This included a wide range of skills. They couldn’t just go to the store for things they needed and commerce probably hadn’t even reached the point of a stable barter system. Basically, if you needed something, you had to make it yourself; so you’d better know how. That meant you’d better teach your children as well. I’m not sure how it is in the rest of the country, but where I live, hunting consists of hiding in a blind and baiting deer (and other animals) into killing range with feed corn. That’s not the way I learned to hunt as a child and I’m sure it’s not the way that our prehistoric ancestors hunted. For them, hunting meant tracking animals to find them and killing them with primitive weapons. If the average hunter today was forced to track their game, they would probably starve to death. Most can’t even identify animal tracks and sign, let alone knowing how old they are or what other messages those tracks might be sending. In addition to tracking animals, our prehistoric ancestors learned their habits. They didn’t have to follow game around for days, as they knew how to find where they slept, where they ate and where they went for water. So they could stake out those areas, awaiting the arrival of their prey, a much more efficient way to hunt. Those prehistoric hunters had to make their own weapons as well. There are three weapons which have been passed through the ages; the knife, the spear and the bow. While they have all gone through numerous design changes through the years, we find all three of these still in use today. That speaks volumes about their effectiveness. 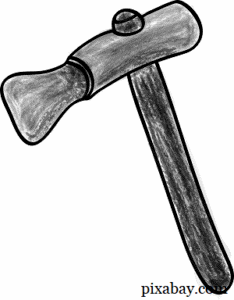 Making weapons is an art, especially making them from natural materials, using only primitive tools to work with. Being able to shape a bow out of a tree branch, with nothing more to work with than a stone knife and other rocks, can’t be easy. Yet these hunters did just that, along with knapping arrowheads, spear points and knives. While it is hard to imagine society falling to the point where the ability to make our own weapons, for both hunting and defense, is essential for survival; the possibility does exist. An even greater possibility exists for having to make such weapons if we are suddenly thrust into a wilderness survival situation. Should that happen, our ability to make these weapons could very well spell the difference between life and death. I seriously doubt that mankind started out building houses, even the primitive sorts of houses made by indigenous tribes. Rather, what little evidence exists, shows that our earliest ancestors lived in caves, something they probably learned from wild animals. Caves are actually excellent natural shelters, providing the essentials of protection from rain and wind, as well as doing a fairly good job of holding in heat. Some prehistoric people groups, such as the Indians who populated Mesa Verde, improved upon their natural caves by using stones to make rooms, dividing large caves into private habitations for multiple families. The idea of building homes came from these people migrating to areas where there were no natural caves to live in. So they were forced to use whatever materials were at hand to build an artificial cave. I imagine those first houses were rather primitive by today’s standards, but they did the job, protecting their owners from the elements. Sadly, we don’t have any examples of what they looked like, so that we could learn their technique. But I would venture to guess, they were simply more primitive or rustic versions of the native houses we have seen. According to the Book of Genesis, the first clothing was made by sewing fig leaves together. While that may have covered their bodies, I’m sure it didn’t wear well. God solved that problem for Adam and Eve by killing animals and making them clothes out of the animal’s skins. One of the many ways that mankind is unique is our need for clothing. No other species on the face of the Earth needs to wear clothes; those that need it, have fur to keep them warm. But even the hairiest of humans doesn’t have enough hair to do much for retaining warmth. Using the skins of animals that they had hunted is a logical solution to the problem of clothing. 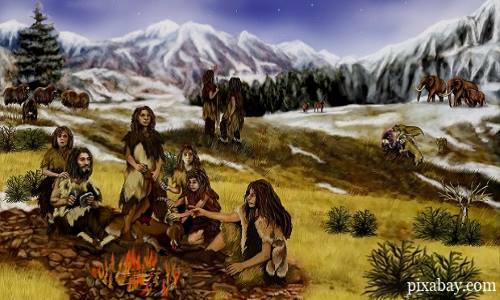 After all, those pelts kept the animals warm, so therefore, they should work to keep people warm as well. The amazing thing is that prehistoric man figured out how to tan leather, so that those skins would last and then figured out how to sew it together to make clothes. But rare is the hunter today that has any idea of how to tan their own hides, making it into useful leather or pelts. Rather, we send it off to commercial operations which do that for us. If we were ever caught in a long-term survival situation, knowing how tan hides would be an extremely useful skill. As preppers, it seems that we focus more on the hunter side of being hunter-gatherers. I personally don’t have an issue with this, since I’m a definite carnivore. But in a survival situation, knowing what plants are safe to eat is a real boon to the diet. I’ve been at this survival stuff for a long time, over 40 years. But I am still weak on edible plant recognition. It’s not that I haven’t studied it, it’s that I don’t use that knowledge. So, I end up losing it and need to study it again. If we aren’t eating the edible plants that nature provides, there is no way that we are going to retain that knowledge for a very long. Speaking of plants, early medicine was all herbal medicine. There wasn’t a pharmaceutical industry. Doctors, by whatever name, learned what plants could be used for treating various ailments and how to use them. This information was closely guarded and passed on to an apprentice by word of mouth. Those early doctors had to gather their own plants and make their own medicines, which consisted mostly of poultices and teas. While I’m sure there are many things they couldn’t treat, they obviously had some success, because their knowledge developed into the modern Medical Industry. Even today, there are people who are experts in natural medicine, deriving medicines from plants. But these people are largely ignored in modern society, mostly because doctors use products produced by pharmaceutical houses. But that doesn’t negate the value of natural medicine, as many of the medicines we use today have their roots in those natural medicines. All the pharmaceutical companies do is find artificial ways of creating things that nature provides to us. If a serious enough of a disaster were to occur, such as an EMP, pharmaceuticals would run out quickly, leaving us without any medicines, other than natural medicines. Having the knowledge of what plants can be used for medicines and how to use them would be an incredibly useful skill in such a situation. I think the American Indians (who qualify as a prehistoric people because they don’t have a written history) and other warlike tribal peoples invented the whole idea of situational awareness. Life was dangerous for these people, full of not only dangers from nature, but from other tribes as well. The ability to recognize danger, before it manifests is a critical skill; one that is truly lacking in the world today. The world around us, especially the animal kingdom, is sending us constant messages of reassurance or danger, yet we don’t recognize them. We merely hear the birds chirping and think how nice it sounds, not that it might actually mean something. Early man was tribal, with the village being the tribe. This was even true of migratory people who followed the animals they hunted. Banding together helped them in the hunt, in defense and in sharing other common tasks. Ultimately, this made survival easier for them and led to the establishment of cities and society. This is probably another skill that prehistoric man learned from watching animals. Many species of animals live in groups or herds. Predators found it easier to hunt together in packs and their prey found it easier to survive by staying together and presenting a united front. While some always died, the herd itself survived, which was the important part. As mankind banded together, individuals began to specialize in specific tasks, putting their energies into performing those tasks and becoming more adept at them. This led to the beginning of the barter system, where these skilled artisans would trade their handwork for other things they needed. Specialization was an important stepping stone in the development of society, as it increased the efficiency of individuals’ work, while at the same time providing a platform for improvement and innovation. Those who specialized in making certain handicrafts developed the skills and interest necessary to find ways of improving their products. Through this, new features improved the traditional weapons and tools that primitive man used. Over the course of time, this actually led to the industrial revolution. Primitive man didn’t waste anything. We see this best, through examining the culture of the American Indians. They used every part of the animals the killed, letting nothing go to waste. Internal organs, which were not eaten, were often made into containers, sinew was turned into bow strings, bone became tools and weapon handles, and skins turned into clothing and housing. You never found a waste dump located next to an Indian village. That’s because there wasn’t any garbage to throw away. Rather, they made use of pretty much everything in one way or another. Should we find ourselves in a survival situation, we would need to do the same!